This is my gloss on the main classes. It is meant for a B/X or Labyrinth Lord type of game. Not all of these classes will probably make it into the player’s document. I don’t want the number of choices to be overwhelming. There will likely be no weapon or armor restrictions (with the exception of elves, who can’t use iron). I’m taking my cue here from LotFP. Still to do: thief and necromancer descriptions. Clerics draw power from higher beings. Some clerics will attempt to subvert this power to their own ends, but wise clerics serve their patron well, for woe it is to attract the attention of an angry deity. Clerics are armored crusaders, most often itinerant demon slayers, and are particularly skilled at banishing arcane horrors such as undead. Not all clerics have the best interests of humanity in mind though. In far off places, there are clerics that serve semi-divine witch kings, or even darker things better left unmentioned. Elves are descendents of beings from another realm that were trapped in this world ages ago. “Elf” is a human word; they know themselves as the lothirim, which means lost, forgotten, and forsaken. Once elves could speak all the languages of nature, but time, and separation from their homeland, have diminished them. They are now a pale reflection of their former glory. Elves still speak some words in the language of creation, and this is the source of their magic. They also fight fearsomely, though they can’t touch weapons (or anything else) made of iron. Fighters, perhaps more than any other class, have many backgrounds. To name just a few: barbarian, knight, mercenary, weapon artist, and magician’s guardian. But all fighters share a reliance on their own military skill and training. They are the only class that gets significantly better at fighting with weapons. They are the only class that can do well what they do best (fight!) while in full armor. They are the best at making their hits count, and powerful magical weapons only attain their full potential when in the hands of a fighter. Magic-users work their will on the world by manipulating dark, arcane forces. Of all the adventuring classes, magic-users are the most feared. Many people blame them (perhaps rightly) for these evil and parlous times. Magic-users come in two varieties, magicians and sorcerers. Magicians are students of the dark arcane arts. Sorcerers have magic inside, whether from demonic blood, changeling heritage, or some other wicked secret. Wise sorcerers seek ways to control their power. Otherwise, it ends up controlling them. Monks are masters of self-discipline. Through long and arduous training in ancient martial and mental arts, they have developed their inherent physical and mental potential far beyond most humans. Their art allows them to evade attacks, strike with lethal force when unarmed, redirect the strength of their enemies, leap fantastically high, and fall with the grace of a cat. Monks are almost preternaturally quick, and their cultivated reflexes allow them to avoid many dangers that would fell other adventurers. A monks is usually the disciple of a master, though some teach themselves from archaic manuals that they have discovered or been bequeathed. This entry was posted in Uncategorized on October 30, 2011 by Necropraxis. The sword & planet genre is relatively new for me. I have not read the Barsoom novels. I did not know about Expedition to the Barrier Peaks before I discovered the OSR a few months ago. My fantasy has long been spiced with steampunk elements, reminiscent of the style of Final Fantasy IV & Final Fantasy VI, but I have usually pictured those as products of the current society (like magitech in Final Fantasy VI) rather than remnants of ancient advanced civilizations. I watched and enjoyed the original Stargate when it came out, but I don’t think it had much influence on my gaming. Despite that lack of experience, the science-fantasy elements of Dwimmermount’s Red Elves of Areon, modules like The Tower of the Stargazer, and the setting of Carcosa, have made me think again about introducing ancient laser rifles and robots to my fantasy games. How would that interact with the rest of the setting though? I like my fantasy setting to feel almost radically unknown (though not necessarily surreal or gratuitously strange, though there is a place for that). Someone living in ancient Babylon, for example, would really have no idea how the universe worked, in terms of metaphysics, cosmology, and possibilities. Does the ocean flow over the edge of the world? Maybe! Using tropes from the sword & planet genre seems to automatically import all kinds of assumptions, such as, off the top of my head: spherical planets, gravity, and outer space being a void. I see this as potentially working at cross-purposes with the sense of the fantastic, even if players are not put off by the genre-bending. One way to handle this would be to just not worry at all about consistency at the beginning, and come up with interesting explanations after the fact, in the same way that one might handle a seemingly contradictory or confusing result when using a set of random tables. There is something pleasingly classical about this approach. Somehow later rationalization does not seem satisfactory in this case though. I have been mulling over a possible solution to this dilemma: the nature of reality varies based on verticality. As characters venture deeper underground, the world becomes less mundane, and as they ascend into the heavens it becomes more systematic. In its deepest reaches, the underworld bleeds into the afterlife, the shared reality of dreams, and other weirder places. Even geometry and gravity may cease to behave as expected. This doesn’t need to be overly schematized or communicated to players, it just serves as a set of conceptual guidelines for the referee. And it reflects many interesting dichotomies, in game tradition, mythology, and philosophy. 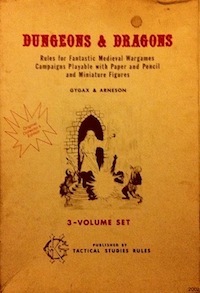 In the earliest versions of D&D, dungeon level was explicitly associated with threat level. It got more dangerous as you went down. This just made sense based on the needs of the game, but has since become enshrined in just about everything that has been influenced by D&D. In Greek mythology, Olympus is up, Hades is down. In Aristotelian cosmology, heavenly bodies are made of perfect substances, whereas all matter on the earth is corruptible, and this was carried over to the medieval worldview (through Ptolemy) and the thoroughly Christianized. There are many inspirational pages up on the web about medieval cosmology. This entry was posted in Uncategorized on October 27, 2011 by Necropraxis. I do find I hate halflings the last few years. I think Jackson killed them for me in the LOTR movies. Anyway, I’ve debated between either this look to depict Halflings that developed from a mammal not related to apes-or halflings as a catchall term/race/class for all anthropomorphic animals about three feet e.g. Reepicheep, Puss-in-Boots from Shrek etc. This entry was posted in Uncategorized on October 26, 2011 by Necropraxis. Undead come in two varieties: sentient and mindless. This reflects the philosophical doctrine of mind/body dualism, and suggests that many undead may be incomplete beings. A ghost, for example, is a spirit or mind without a body. A zombie is brute flesh with animating will but no mind or soul. What happens to the spirit when the body is called back to service in the case of the mindless undead? Does the campaign world have an afterlife or an underworld where the spirit resides? Is the spirit gladdened by the body’s return to service? What if every time a skeleton or zombie is animated, the ghost is also pulled back to the mortal realm, with no chance for eternal rest until the zombie is destroyed? Ghosts could be great allies to player characters. Perhaps necromancy requires that the ghost be imprisoned, preventing it from reuniting with the body, resulting in necromancers collecting such trapped spirits (which would also be of interest to demons or other entities that might value such things). This would result in necromancers making many ghostly enemies, and might contribute to their terror of death and their own search for immortality and lichdom. Failing that, they would seek to escape the grasp of the underworld by true extinction of the soul. A sort of necromantic nirvana. These trapped spirits could also be bound to objects. Maybe some or all magic items are the byproduct of such necromancy. FrDave had a post about a magic sword that was infused with the spirit of an elf-maid, and in D&D magic swords are traditionally sentient; this is another way to explain where magic swords get their sentience. The most terrible form of zombie creation: tearing the soul out of a still living person, leaving only an undying and mindless slave. This entry was posted in Uncategorized on October 24, 2011 by Necropraxis. My first post to this blog was about a campaign that was called Blackwater Falls. As I mentioned there, the game started using D&D rules, but was then transitioned to a custom system that we designed. I have come now to appreciate basic-style D&D rules much more, and I don’t think I would want to play again using this custom system, but I think it is interesting enough to sketch out what we came up with, at least the parts that I remember. The basic design was inspired by the White Wolf system of combining attributes and abilities for task resolution. We really liked the idea that a character’s inherent makeup and training would combine to give a probability of success (really, this is a systematization of the idea of nature and nurture). What we didn’t like was the complicated multi-die plus target difficulty mechanic that White Wolf used. We wanted to be able to adjudicate things with a single die roll, like an attack roll in D&D. Each attribute, skill, or power was rated from 1 to 10. In the case of attributes (like strength), 5 was average, 1 was incompetent, and 10 was world-class. In the case of a power or skill, 1 meant superficially trained or limited power and 10 meant mastery. Any particular task resolution would be handled by combining an attribute with a skill or power. This is almost directly from White Wolf, which would have combinations like Strength + Brawl, Dexterity + Dodge, and Intelligence + Linguistics. In that system though, each score is rated from 0 to 5, and each point adds another d10 to your dice pool. Our system would yield a number between 1 and 20. This number would then be adjusted for situational difficulty, down for something hard, and up for something easy. Then we would try to roll less than or equal to it on a d20, like a D&D ability check. I don’t remember every attribute we used, but I know they included Strength, Agility, Stamina, Intelligence, and Appearance. We used a linear point-buy system, and, like in White Wolf, new points in attributes and skills could be purchased with experience. The skills selection was free-form. If you wanted your wizard to be able to cast a spell like burning hands or fireball, you would make up an appropriate skill or power that was not too general and take points in it. For burning hands, the power might be pyromancy. The power value would thus both determine what you were capable of (a single point might allow lighting a candle, or manipulating a natural fire, while a fireball might require 4 or 5 points). The referee would be required to rule on whether a particular effect was consistent with a skill value. A number of common permissible effects were quickly accumulated through use (similar to the precedent in law of past cases), but we never felt the need to codify or write down what particular skills could do, which left significant room for creativity. Special racial or supernatural abilities were also represented as skills and had to be purchased with points in the same way. One example of this was a character of mine that could switch heads (yes, you read that correctly). His name was Clair de Lune and he had a collection of heads in special glass cases and a magic scarf that he used to connect them to his body; this was related to some curse in his background story and mechanically he had some sort of skill which allowed him to harvest body parts from others. Most of our characters were not that odd, but the system seemed to support such concepts. A health score was derived directly from stamina, though I don’t remember how. Full health might have just been equal to stamina. I have no memory of how we handled armor. I think it both made characters harder to hit and absorbed some of the damage points, in the process decreasing its own pool of structural points (or something like that). I believe we called this system Puppeteer. Unfortunately, I seem to have lost all hard documentation. This entry was posted in Campaigns on October 23, 2011 by Necropraxis. One relic of the older editions are level titles. They started out as wargaming shorthand (as in, a hero is worth 4 fighting men). As video games have show, even otherwise meaningless achievements are psychologically very powerful. Rather than just hand out titles mechanically with level progression, why not make characters earn them literally? Sample titles: champion, conjurer, veteran, journeyman, robber, baptist, demoncaller, etc. In addition, any organization within the campaign world can have a series of ranks or titles. Such a collection of titles is also a list of adventure seeds that suggests profitable courses of action to the players without compelling them to do anything. There is no reason why a title could not also be accompanied by an XP award, optionally. It is often suggested that it would make more sense, for example, for a magic-user to gain experience from casting spells. Rewarding experience for titles gained seems like a reasonable way to go about giving experience for activities without overly changing the underlying incentive structure. And it reflects the fact that the first time you do something is special. You can get experience for killing more than one dragon, but you can only ever get the dragonslayer title once. Don’t forget how Bilbo described himself to Smaug: clue-finder, web-cutter, stinging Fly, ringwinner, luckwearer, barrel-rider. Maybe I’m being unnecessarily naturalistic, but doesn’t it also make more sense to refer to Felonius as a seer after he has successfully scried something? This entry was posted in Uncategorized on October 21, 2011 by Necropraxis.